"You want to sail on an Arab dhow? You're lucky today! Talk to him!" Abdallah bin Jassim, a Dubaian historian who manages the Saeed Al- Maktoum Museum Home, pointed to an elderly man sitting beside me. "He was for years a nakhuda (captain) of a pearl-diving dhow - the best skipper in the Arabian Gulf." A distinguished-looking gentleman, made even more dignified by his flowing Arab dress, Abdullah appeared to be proud of the former dhow skipper. After introductions, I asked the soft-spoken nakhuda to tell me about his seafaring life and if pearl-diving in dhows was continuing in our times. "Pearl-diving in dhows? Of course not! The youth today are spoiled! All they look for are the pleasures of life. It wasn't like this when I was young." Ubayd al-Muh.ayri the former dhow captain smiled. When I asked him if he yearned to sail the Arab dhows again, he seemed amused. "Sail again! I am 75 years old. Do you know that pearl-diving was a part of hell?" He continued, misty-eyed, "Yet, for me the old days are preferable. In those days, we did not worry about material wealth. We were content to live on dates and coffee." A tear came to his eye as he reminisced about his youthful years, "I was eight years old when my father first took me with him on a dhow. When I turned fifteen, he took me down some 15 meters (40 feet) to the bottom of the sea and taught me how to find the pearl-carrying oysters in the deep. For a hundred days every year, we worked the oyster beds. Until I became a skipper of a dhow, it was a harsh life but I was content." The author on the waterfront in Dubai. "Today, the young men want to live in luxury and own fast cars. Fathers to them do not mean a thing. It's only the daughters who still think of their parents. "Putting his hand over mine, he went on, "It was not like now! In my younger days, the father was the head of the household. Every member of the family obeyed him until he died. As I bade Abdallah Jassim and the former nakhuda adieu, I thought of my fantasy to one day sail on an Arab dhow. Ubayd al-Muh.ayri had somewhat dampened my yearning to sail on these crafts, but not entirely. I had waited too many years to easily be stymied. From the vast amount of adventure literature that I read in my youth, none impressed me more than Alan Villier's book, Sons of Sinbad, in which he describes his journey on an Arab dhow from the Arabian Gulf to the East African coast. Sailing in his footsteps and capturing a bit of the ancient Arab spirit of adventure became one of my burning ambitions. For years I dreamt that one day I would sail on one of these ships across the Arabian sea to exotic lands. A belly dancer entertains the passengers. The years rolled by and now I found myself in Dubai, the United Arab Emirates' booming economic heart. Along the shores of its Creek, which divides the city into two parts, there were moored hundreds of dhows loading and unloading goods. However, their sails and gear had been replaced, by motors and the other gadgets of our modern age.Like most of the visitors who yearn to sail in these once-cherished crafts, I knew time had passed me by. Yet, I still wanted to taste the pleasure of traveling the seas on a dhow even if it had to be tourist style.Alas! The days were gone when the sight of huge fleets of dhows, with their sails bending to the wind, covered the horizon of the Arabian Gulf. Today, one can see these ships only sailing for sport or for the pleasure of tourists. Like most of the visitors who yearn to sail in these once-cherished crafts, I knew time had passed me by. Yet, I still wanted to taste the pleasure of traveling the seas on a dhow even if it had to be tourist style. Alas! The days were gone when the sight of huge fleets of dhows, with their sails bending to the wind, covered the horizon of the Arabian Gulf. Today, one can see these ships only sailing for sport or for the pleasure of tourists. That evening, my yearnings were to be fulfilled. As we boarded our decked-up tourist craft, anchored on the shore of Dubai Creek, I looked around. 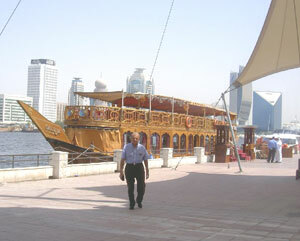 The dhow of the bygone years had been transformed into a tourist ship par excellence. Everything was spick-and-span from the white tablecloths and the clean uniforms of the crew to the varnished planks of the deck. It was apparent that the old had been overpowered by the new. 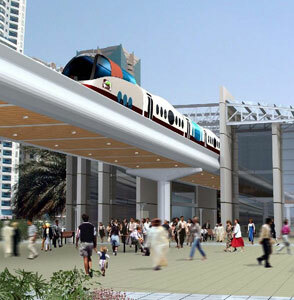 A high-speed train in Dubai. The waves of Dubai Creek gently lapped and rhythmically swayed the ship, as, with Arabic music in the background, we feasted on the tasty Arab food - much different than the Spartan food of dates and rice described by Villiers in The Sons of Sinbad. The purr of the motors and the gentle wind lulled us as we sailed in the shadows of illuminated sky-reaching edifices which would have been considered magical structures in Sindbad the Sailor's time. Sated, I sat back and fantasized about the past while watching an oriental dancer entrancing the passengers. The heritage and atmosphere of the dhow took me back to the era of The Arabian Nights and Sindbad the Sailor in whose days dhows, like ours, brought back from distant lands spices, poetry, and romance. On such a ship Sindbad could very well have dreamed up the unreality and hallucination of his tales. In two hours - to me it seemed minutes - as we neared the end of our journey, Akbar, our Indian waiter, bidding me adieu, smilingly enquired, "Did you enjoy the excursion?" "Of course! But it was not like one of Sindbad's journeys," I grinned. He looked at me strangely. Apparently, he had no idea to what I was implying. To him, Sindbad and his tales were of no interest. 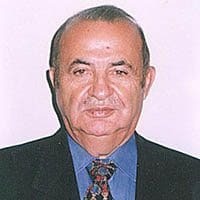 He had come from India to work and make his fortune, then return home and enjoy the offerings of the 20th century. Unlike myself, he was living in reality. 1) Dubai has good connections with the rest of the world. Some 106 airlines operate from the city to almost 160 destinations worldwide. The airport has been expanded and has become one of the world’s intercontinental transit centers, processing some 22 million passengers. By 2010 visitors are expected to reach 60 million. 2) Most western European, American and Canadian citizens can enter the UAE without a prior visitor’s visa; they can obtain their visas at the entry points. 3) Autos rent at a reasonable price. A small auto, fully insured, costs about $30 per day - less if you bargain. Roads are excellent, but beware of two legged tigers driving autos. 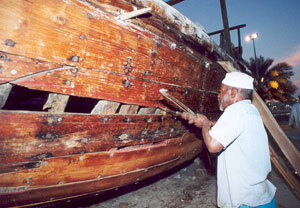 A craftsman repairs a dhow at the Dubai Heritage Village. 4) The U.S. dollar is equal to 3.67 UAE dirhams. The rate has remained the same for over two decades. Exchange cash or traveller cheques at the money exchangers; they do not take commission. 5) A great way of seeing Dubai is to take a tour of the Creek by traditional dhow. Some of Dubai’s major landmarks can be viewed from this waterway. 6) Major international hotel chains are well represented in Dubai. However, there are other very reasonably priced and excellent abodes to be found throughout the city. The choice is wide. There are 373 hotels and hotel apartments in the city. 7) In peoples’ eating places, one can dine for as low as $4, but the average cost of meal in good restaurants and hotels runs from $20 to $50. For luxury dining try the Al-Boom Tourist Village with its series of restaurants - some located on dhows. It specializes in Gulf dishes and all types of seafood. 8) The best time to travel to Dubai is from mid-January to mid-February during the month-long ‘Shopping Festival’ with its street parties as well as its shopping sales and bargains, held in a carnival atmosphere. 9) No traveler should leave Dubai without going on a desert safari with its sand duning, camel riding, and desert feast. 10) For other activities, attend some of the horse racing and camel racing events held during the cool winter months. 11) Dubai is a shoppers’ dream world - its more than 30 huge modern malls offer the products of literally all the nations on the globe. The most popular gifts visitors take back home are: Arabian coffee pots, silver and wooden miniature dhows, gold jewellery, Persian carpets and Arabian curved daggers. Note: All prices quoted are in U.S. dollars. Tel: (971 4) 223 0000. Fax: (971 4) 223 00 22. Hi people, As a fact I love travelling, like many other people but I have a unique taste about it, which is in particular about cruises, and write now I am confused about weather should go for the Dhow Cruise Creek or the MSC Cruise. 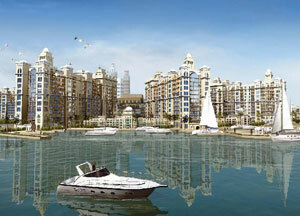 MSC Cruise is luxurious but the Dhow Cruise Creek is more Natural and Classic. 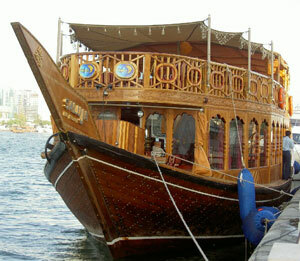 Both cruises have their own unique experiences but as you said the Dhow Cruise Creek is a classic fantasy adventure. I have gone on the Dhow Cruise Creek three times and enjoyed each of them. It’s a good way to feel history and the sea.